There is no commodity other than gold that has a better track record for being a solid, long-term wealth store, especially during economic episodes when the entire world’s financial system is thrown into chaos. Every time the world’s financial system fractures into smithereens most investors, corporations, financial institutions and governments hit the panic button and head for gold and other precious metals, to save or protect their wealth from economic hurricanes that were created by themselves in the first place. Monetizing bad debts and passing it along to unsuspecting financiers, who are more interested in trading for commission more than they are in trading well rounded bonds, is still an ongoing problem, despite the fact that the same actions brought upon us the 2007/2008 financial meltdown. So how do we protect ourselves from these trade monsters that create nothing but the coming financial disasters, which has its most negative effects upon the average ordinary person? Many would say buy gold without even blinking, but is buying gold for everybody? Well, in actual truth, gold does provide a decent level of protection against financial storms, however, gold is expensive and in order to make the difference during a financial storm, the amount of gold one possesses to effectively deem themselves as being protected has to at least amount to around 20 % of their total net worth. If your total net worth is 20,000 dollars, than having 5,000 dollars in gold could offer a little relief, but during a falling market it is likely going to be one investment that will provide secure revenue gains against inflation, when comparing against the same amount invested elsewhere during such an economic period. It is true that many who buy gold bullion do it solely to protect their wealth, due to the fact that each time a financial turmoil emerges, the prices of gold and most other precious metals such as silver, platinum and palladium go ballistic. When this happens the value of the precious metals an individual possesses could almost double. It was only due to this reason that gold has always been seen as a safe haven by most, however, the condition for investing in physical bullion requires gold buyers to buy gold early, during stable economic times when the price is lowest, Then plan to hold it until an economic event such as the GFC in 2007/2008 occurs again. Gold owners should have the mentality of holding the metal for the long term, and have the expectation that they may not need to sell for a long time to come (long term investment). For lower income investors, building up a personal gold reserve is recommended in a minimum of 1 ounce bars purchased at any one time, this provides you with gold purchased at lower premium compared against the world gold price. Smaller gold purchases often have a much higher premium, offsetting the benefits of owning gold in the first place, and making returns on investment more difficult. Nevertheless, gold has always been fundamental to human society with regards to trade facilitation, due to its past stand and position as a common currency. Until even present times, governments commonly used gold to offset trade deficits when the need would arise, in modern economics however, gold has minimal role to play outside of the investment, jewellery and technology sectors. Gold or silver are good commodities to hold, but the question is affordability as it is also a capital intensive investment, an investment that could possibly generate revenue if it was put somewhere else during good economic times, in contrast to gold which incurs costs such as storage and insurance (unless of course you were to take a risk in a hidden vault at home – uninsured). Thus when it comes to investments, the best way to go about it is to consider all available options prior to making that investment. 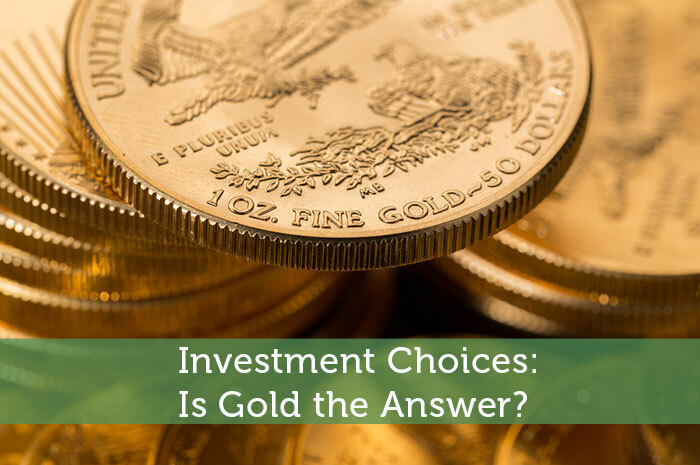 Investment Choices: Is Gold the Answer?